Mullett Lake in Cheboygan, MI - 3D Map (Black Frame/No Glass Front) 14 x 18 IN - Laser carved wood nautical chart and topographic depth map. Express your lake pride and have a memento to honor your memories for years to come. This 3 dimensional laser cut lake map of your Lake will be accurate and beautiful. It is a wonderful way to explain everything about your lake to family and friends. You can use it to thematically decorate your walls as it adds an instant lakehouse feel to any space. A 3D laser caved depth map is a unique piece of art for those who admire the beauty of a your lake. Our Lake Maps can be found displayed on walls of lake homes, cottages, lake lodges, beach houses, and cabins. Ignore lake on product image (It is only a sample lake). All items are custom made for your Lake. Great decor for any lake house! If you have any questions about this product by Long Lake Lifestyle, contact us by completing and submitting the form below. If you are looking for a specif part number, please include it with your message. St Clair River (East China Region) in St Clair, MI - 3D Map 16 x 20 IN - Laser carved wood nautical chart and topographic depth map. 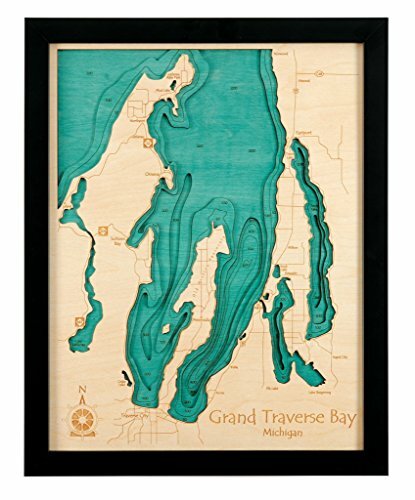 Lake Superior (w Lake Michigan and Lake Huron) in Great Lakes, GL - 3D Map 16 x 20 IN - Laser carved wood nautical chart and topographic depth map. Grosse Ile - Detroit River in Wayne, MI - 3D Map 16 x 20 IN - Laser carved wood nautical chart and topographic depth map. Long Beach Island in Ocean, NJ - 3D Map 16 x 20 IN - Laser carved wood nautical chart and topographic depth map. Minocqua Chain of Lakes in Oneida, WI - 3D Map 16 x 20 IN - Laser carved wood nautical chart and topographic depth map. Waitts Lake in Stevens, WA - 3D Map 16 x 20 IN - Laser carved wood nautical chart and topographic depth map. Clearwater Lake in Wright, MN - 3D Map 16 x 20 IN - Laser carved wood nautical chart and topographic depth map. Lake Shetek in Murray, MN - 3D Map 16 x 20 IN - Laser carved wood nautical chart and topographic depth map. Keuka Lake in Steubens Yates, NY - 3D Map 16 x 20 IN - Laser carved wood nautical chart and topographic depth map. Pleasure Island - Carolina Beach in New Hanover, NC - 3D Map 16 x 20 IN - Laser carved wood nautical chart and topographic depth map.